the violin plot can’t show a better curve with small samples. In Hintze’s paper, he thought a smooth curve with at least 30 observations. But the box plot may stand for a smaller observations. Also the bandwidth need to be chosed carefully. the modification box plot could show the number of observations in the groups using the var width while the violin plot couldn’t. When we make some comparison between different groups, the violin plot will hide this information. Another problem is the notch in the box plot to compare the median. In the violin plot, we get a better understanding of distribution of violin plot but less with comparisone with ‘strong evidence’(Chambers et al., 1983, p. 62). Wiki pedia: you need to read the further readings and the references to know more details about violin plot. 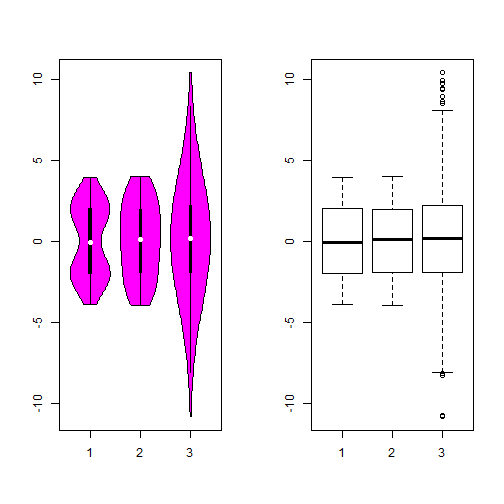 I recommend ggplot2 to show the violin plot, it is beautiful anyway.